Buy ‘A’ Lot Wholesalers To Sell Babies? 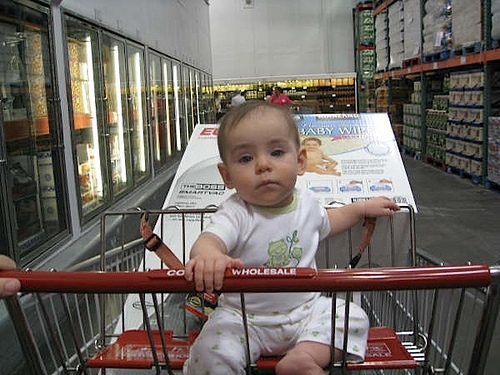 Although this baby appears to be on a ride-along with Mommy, she is actually on the shopping list. After much speculation and gossip among the wholesale community, Newton Stonebreeze, East Coast Regional Manager for Buy A Lot, made the announcement in his weekly staff meeting. “To put the rumors to rest, it is true that we are expanding our already immense variety. We have decided to add a Children section to some of our stores.” Although this sounds like a department dedicated to Osh Kosh onesies, inflatable slip’n’slides and Barney boxed sets, it is an animal of a completely different nature. Buy A Lot is taking the unconventional plunge into children sales. As with everything else in Buy A Lot, the more you buy the greater the savings. For example, if the Octamom had been patient enough, she could have saved herself the immense pain and emotional stress of birthing 8 children for $500. The idea originally came about when Buy A Lot employee Steve Colgate decided he wanted to be a father but did not have the ability to do so. “I have always wanted to be a father but I am completely incapable of attracting a woman” said Colgate. Admittedly an impatient man, Colgate thought about adoption but could not bring himself to fill out the lengthy application. This department is being met with mixed reviews from Buy A Lot faithfuls. Mary-Lou Block, a 15 year Buy A Lot member, is outraged. “Selling children hasn’t been done for a reason…IT’S WRONG!” Great point Mrs. Block, however as we all know, Americans look for anyway to spend their money on unconventional and somewhat unethical products. Buy A Lot bigwigs are expecting the new department to explode and never turn back. As intriguing and unique as this expansion is, the question on many consumer’s minds remains. “What’s your return policy?” In an attempt to get the ball rolling, Buy A Lot is offering a buy one get three free promotion to new members. Get them while they’re hot America, it won’t be long ’till Congress aka “The Fun Police” get a hold of this one!